Sony’s Paris Games Week conference has come and gone, bringing with it a glut of new trailers for us to feast on. There were trailers for brand new games as well as confirmed upcoming titles from both first and third-party studios across the PlayStation VR and PS4 platforms. To make your feasting feel more like a buffet and less like a restaurant-hopping scavenge, we’ve gathered together the biggest and best trailers from the show right here for you. Without further ado, here are the must-watch trailers from Sony’s PlayStation Paris Games Week show. First up was the new IP from inFamous developer, Sucker Punch. Ghosts of Tsushima looks like it’ll be a fantastic addition to any game library, taking players to feudal Japan to play as a samurai at the time of the Mongol invasion. 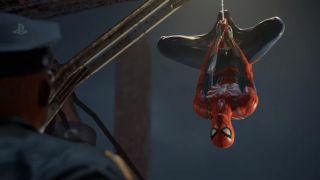 One of PlayStation’s most highly-anticipated exclusives is the upcoming Spider-Man game. Before now, we’ve mostly seen the game’s mechanics lauded in demos but this trailer was an altogether more emotional and story-focused affair. Giving us a look at Peter, his friends and his enemies, this is a trailer that looks just as exciting as the movie was. Given that Detroit was a game that was first revealed at Paris Game Week we were very hopeful that we’d see more about it during this show. We weren’t disappointed. The game got a brand new gameplay trailer which shows this is going to be a highly emotional and dark game, with difficult choices for the player to make, Heavy Rain style. We weren’t sure if The Last of Us Part 2 would appear at Paris Games week but, lo and behold, it rounded off the show. If we’re honest, we weren’t sure when this trailer started whether it was The Last of Us. This footage shows a much darker game than even we anticipated, and it makes for some pretty grim viewing. A brand new game announced at the show by developer PixelOpus, Concrete Genie is a third-person action adventure game that invites you to embrace your creativity. This trailer really creates a sense of magic. The game will revolve around a bullied teenager named Ash, who uses his magical paintbrush to draw incredible landscapes and creatures on the walls of his abandoned hometown. Discovering that his drawings can come to life, Ash decides to try to use them to restore his town to its former glory. Sony’s PlayLink platform, first revealed at E3 this year, is an innovative one which attempts to bring more people into gaming than ever by allowing them to play games together on their smartphones. Erica will be the next PlayLink game, though it’s much darker affair than those that have come previously. Looking like an interactive movie, Erica is a live action mystery game will have players solve a murder together. Shadow of the Colossus was revealed to be coming to PlayStation 4 in E3 earlier this year and now we’ve got another look at the game’s improved visuals. This truly does look set to be one of the most stunning games the PlayStation will have to offer and it's coming on February 6 2018. We’re not actually all that short on God of War footage, but this is going to be one of PlayStation’s biggest exclusive games and it’s certainly being treated as such. This new gameplay trailer gives a look at the game’s combat system and how Kratos’s son will come in useful during fights. PSVR got a lot of attention at this year’s show, and one of the games we’re most excited about is Blood and Truth. From the developers of The Getaway, this looks set to be an action-packed game that will bring some more GTA-style action to the PSVR. Another exciting PSVR game to get a trailer is the Resident Evil 7 DLC Not a Hero. The VR element was one of the best parts of Resident Evil 7 and we’re glad to see support for it continue. Not a Hero will be available from December of this year and it definitely looks like it’s going to give some good scares. Finishing up our roundup is a brand new look at Monster Hunter Worlds, coming to PlayStation in January 2018. This is an exciting and lengthy gameplay trailer, but by far the best thing about it is the reveal at the end relating to a Horizon Zero Dawn tie-in which will be exclusive to PlayStation players. For more in-depth coverage of the show, make sure you read our full piece on all the big Paris Games Week announcements and their details.